This study explores vocal production in the field of foreign language pedagogy. It does not demonstrate a new pedagogic method. Rather, the investigation carried out in this study yields general principles on the nature of voice that will have specific consequences for the vocal pedagogy. A better understanding of how the vocal/language/speech system works will give directions to help retrain the innate tools we all learned to use when acquiring our mother tongue, that is, our first foreign language. In order to understand how systems function, scientists have long employed techniques that reduce systems to their component parts. After the nature of each component is determined, its manner of interaction is explored. Our method is exactly the same. We explore the components of vocal production and their interactive relationships as parts of language. To examine how voice production is used in learning a foreign language, this study combines, relates and synthesizes the work of more than 40 specialists in several language/speech related field, sign language, artificial intelligence and phonetics. Two definitions of the voice, invisible, yet essential dimension of the human experience. -An object of scientific investigation: As studied by theoretical sciences, such as Phonetics and Acoustics, as well as Anthropology and the study of human behavior. -A personal and artistic experience: Each vocal performance is unique; each vocal production has its unique characteristics. This experience is the domain of Religion, Poetry, and Art, which govern the rules of its performance, and the terms of its pedagogy. Learning a foreign language redefines ones relationship with ones native language: one does not know one's (mother) tongue until one learns a second language, called a foreign language. One realizes that the (verbal) sounds one so easily makes to describe thoughts and feelings to others who share the same tongue were once as strange as those of the new language one is now learning. The first language first, therefore foreign, was learned by babbling, gurgling, grunting, whispering, shouting, laughing, and first and foremost, by crying. The memory of those early productions of (vocal) sounds has been forgotten, in the same manner as one has forgetten how one learned to sit, walk, or ride a bicycle. Speech and hearing have a complementary and continually redefining relationship. The ear discriminates between voice productions, and compares them with those from the environment. An infant plays with his mouth and tongue and listens to the impact of the sounds on his eardrum. He begins to make organized and repetitive sounds with his voice. His ear learns to perceive how well he is articulating as he discriminates between his productions, and compares them with those from the environment, enabling him then to refine his own productions. Speaking is an activity. Learning the spoken parts of a language is entirely distinct from learning its grammar and syntax. The former emphasizes skills, while the latter demands intellectual synthesis. Vocal production is compared with other articulatory models, such as hand coordination, breathing, puppetry, by showing musicians, athletes, actors, singers, and foreign language students, learning and practicing their skills. The articulatory mechanism of the vocal apparatus is as delicate a manipulation as that of the strings of a puppet. It is inner subtlety combined with outer micro-precision that determines the ultimate quality of a production, of voice and body. Perfecting speech functions is not just a matter of developing the body, a fact well known from actors and singers, but involves the mind and the psyche as well. The mind, like a good musician, runs the activity of speech through an harmonious coordination of the organs it animates. On the physical side, speech is determinated by such factors as strength, flexibility, speed, endurance and sense of touch. The actual outpouring of such creative acts is channeled by the body. For example, it is known that a poor sense of balance and rhythm often accompanies deafness: many deaf children find simple feats of coordination extremely difficult. These faculties require concentration, co-ordination, adaptation, and creative improvisation. Language is composed of a finite number of vocal elements, coordinatated by the speaker to yield an infinite number of statements. The coordination of these vocal elements becomes automatic, like an improvised execution. Thus, the nature of oral training is its regularity, as it is the case in other skills, such as dance, music, and in all vituoso performances. The skill is in making it look easy and effortless. If the original manner of learning -- playful manipulation of vocal musculature to produce sound compounds -- is reintroduced, with activities that correspond to developmental patterns of linguistic advances in the child, the vocal skill will be reawakened and made available to the student as he reenacts the babblings of the first steps he took into his mother tongue. The study begins with an examination of the intrinsic qualities of the most elementary vocal form, and pre-verbal sound; it ends with an exploration of the inherent characteristics of the most sophistical forms of voice production, poetry and singing, which maximalize potential of meaning and sound. Underneath Language: Before presenting the process by which the voice becomes language, the program starts with a presentation of elementary oral structures, non-verbal and pre-verbal ones. What does the voice do before it is engaged in the activity of speech or singing? What is the difference between human and animal vocal sounds? What other ways do humans use to communicate with their body? This section explores the physiology, vocal anthropology, oral analytics, animal sounds, to examine non-verbal and pre-verbal structures, and the objective correlations between the body and the voice, that is, what the voice does before it can get into the task of speech. Before getting into the business of making sense, the vocal apparatus is asserting itself in collaboration with the senses. Presentation of the bio-mechanics of the vocal apparatus. Celia STEWART explains that a single second of speech requires the coordination of some 160 movements of the organs and ligaments which compose the vocal apparatus. Speech accounts for only 10% of the communication process. Tone of voice, use of silence, bodily tension, facial expression, the rhythm of movements, use of space, gestures, and many other signals -some known, some unknown- play a crucial role in communication: we communicate not only with our voice, but with the body, and the space it cuts out. Words and body movements occur simultaneously in the creation of a single event. Laurence WYLIE presents the body as a model for social organization, and main agent of communicative strategies. Jacques LECOQ explores the coordination of body movements in the production of speech. Kristin LINKLATTER and Ron PANVINI explore the mutual dependence of the voice and the body in their practice as voice therapists. The words flow on top, while underneath is a river of emotions, sometimes calm, sometimes turbulent. Alexander LOWEN discusses his work with the voice in the therapeutic field. Marie-Louise AUCHER examines the relationships between the voice and the mind. André MARTINET, discusses the difference between phonation, vocalization and speech, in animals and human beings. Pediatricians, pediatric nurses and parents discuss children's milestones in the linguistic advances of young children. Speech and melody, mixed at the babbling stage, slowly separate. Very young babies are learning to swim and to walk. This section considers facial expressions, speech synthesis and voice recognition, deaf children's sign language acquisition, and the work of puppeteers as many forms of communication produced through articulatory mechanisms and devices which combine inner subtlety with outer micro-precision. These same qualities regulate speech, which is obtained from the combination of a small number of vocal elements, the phonemes. The face is the most expressive plane. This complex surface until now has proven very difficult for computers to recognize.The face is truly a multimedia center of operations. STENDHAL, a contemporary of Charles DARWIN, understood the importance of the face in the taming of passions and emotions. Examination of the sensory apparatus: perceptions, receptivity and responsiveness. Facial musculature communicates with the voice, either approving of, or disapproving its utterances, sometimes even disproving them. Presentation of research applications of Linguistics, notably of Phonology and Phonetics, in the spech synthesis and voice recognition. Research programs are developed in various centers in the world, notably that of IRCAM (Music Research Institute, Paris) and the University of Paris III. The teaching method of deaf children takes the form of a discovery of dramatic phenomena: silence, sound, and words. The deaf child listens intently to a speaker, while at the same time he watches his lips and puts his hand on his face so that he can feel his jaw muscles. He spends hours of practice in breath control, mouthing vowels, and studies speech positions with a model tongue and palate. Recent research in speech development has proven that a hand-related psychophysical principle must be somehow involved in the learning process: as long as the fingers are unable to move freely, speech cannot develop. Presentation of Laura Ann PETITTO's works on how hearing-impaired infants use their hands to express themselves and communicate with the outside world. Puppeteers demonstrate how they master the coordination of mechanical devices until they can performe with them the most gracious figures, in other words, until they can perform at will. This is put in perspective by comparing it with earlier scenes of infants learning to swim and to walk. The name of the exercise is regularity. Vocal training proceeds with activities relating to body movements, symbolic representations, figure-ground perception, intersecting and embedded figures, spatial positioning, voice discrimination, verbal and physical dramatization, sound games, duplicating sound patterns, rhythmic dramatization and spatial positioning, rhymes, music and songs. These activities are documented in various institutions in Europe and North-America. This section delineates the process by which the foreign becomes incorporated to the familiar to redefine the notions of maternal and foreign languages. It examines French and English students learning their own and one another's languages with Caleb GATTEGNO's didactics, which convert vocalic sounds into color. It also examines oral training for people with hearing disabilities. 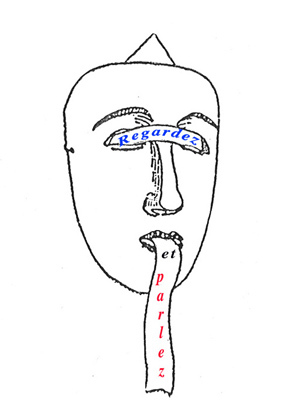 Linguist André MARTINET presents the history of French Language, in France, and other French-speaking countries, and shows how words exist beyond their phonetic transcription. The process of the foreign becoming familiar is what the acquisition of a skill consits of. One's first foreign language is one's mother tongue, that is, a tongue which formerly was foreign, and thus had to be learned. That is why this only comes in full view when one has begun to learn a foreign language, to acknowledge that a language reflects its mechanisms in another one. Sounds and speech patterns of both English and French are sampled, offering native speakers of these languages a contrasted perception of their mother tongue, as it is heard spoken by foreign students. English speakers studying French, and French speakers studying English are presented. Carolyn FIDELMAN and Laurence WYLIE discuss the merits of approaches which combine verbal and non-verbal activities. Peter GUBERINA presents applications of his work with deaf children in the study of the speech patterns of foreign languages. André MARTINET presents the factors which influence the evolution of the soundshape of languages, including accent and diction changes. Jacques CHAURAND examines developments of the French language from the Medieval period to the present time. Language development is considered in other French-speaking countries, such as Senegal, Quebec, and Haiti. This section traces the bio-mechanics of the voice and the low structures of speech as tools of communication that support the voice as an instrument of eloquence and creativity. Vocal creations from poetic and theatrical performances explore the interactions of the body and the mind in voice production, providing with concrete realizations the categories and notions discussed in the program. Sound goes on record: Words exist beyond their denotations; the voice fluctuates within the individual, and varies from one speaker to the next. Study of a collection of French speakers in a variety of settings and situations, using the variables of age, class, gender, geography and emotional context. Actors read slowly the transcripts of some particularly energetic vocal performances, such as the radio broadcast of a football game, or one at an auction. Poetry is a deed, rather than the mere report of one. Indeed, poetry is the most expressive and highest form of communication. Its possibility supports the voice as an instrument of eloquence and creativity. As to the foreign language student, it can be said that he is, in a sense, and in all innocence, engaged in the same activity as the poet is, which is to make it new. For, each time becomes a new time for he who takes sameness through innovative ways of expressing it. The body is a music intrument, which is played by the mind; its scales are the thoughts and emotions through which the individual expresses himself. The segment presents activities, such as breathing, relaxation, body postures, which are practiced, spontaneously and/or voluntarily, in vocal production, from babbles to Sprächgesang, from prononciation drills to aria, on theatrical and operatic stages, in foreign language classes, and in speech therapy sessions. It presents a comparative study of the tasks performed by foreign language students, singers, athletes, actors and musicians. Participants discuss their experience from the practice of learning and teaching vocal skills. They explain how the practice of the instrument of the voice brings about a new awareness of the way each production of a sequence of gestures and words composes a decision; there are enough of them produced to entrust each and every performance with the responsability of an interpretation of the world. Marie-Louise AUCHER, Association Nouvelle de Psychophonie. Jacques CHAURAND, Author of a History of French Language. Georges ELISEE, Program Director of poetry courses in high school. INTERNATIONAL INSTITUTE OF PUPPETRY, Charleville-Mézières. Jacques LECOQ, Ecole Internationale de Théâtre. Henri MESCHONNIC, Université de Paris VIII. Xavier RODET, Université de Paris III, IRCAM. Roslyn YOUNG, Centre de linguistique appliquée, Université de Besançon. René DESCOUT, Artificielle Intelligence Center, Montréal, Canada. English Language Classes, kindergarden and primary schools. French Language Classes, high-school and college courses. Joan LA BARBARA, Vocal Performer. James NOBLITT, Institute for Academic Technology, North Carolina. Laura Ann PETITTO, McGill University, Montréal. This research program was made possible with two Fellowships Lavoisier, in 1991 and 1992. It was undertaken at the Maison Française of Columbia University of New York City, which provided constant attention and warm support to the development of the project. The Lavoisier Fellowship is a program of the Ministry of Education in France to promote research in North America.